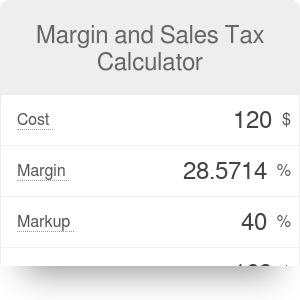 Margin and sales tax combines those two operations in a single calculator. The margin and sales tax calculator combines these two issues as they often coexist - a salesman needs to find the net and gross price based on his desired margin and the sales tax rate. What is calculated is up to you - you may be interested in how much you may pay for your goods to the wholesaler (provide gross margin and your price) or what margins you're getting, given certain cost and your price. We also have a variant that calculates margin and VAT if you happen to live or work in a country where value added tax is in use. Margin and Sales Tax Calculator can be embedded on your website to enrich the content you wrote and make it easier for your visitors to understand your message.